Catalonia’s drive for “independence” has unleashed a chain reaction of viral social media support that’s frighteningly resurrected civil war-era rhetoric, but the most dangerous consequences of this domino effect are yet to come if the separatists are ultimately successful in their quest. The Catalan “independence” cause has taken the world by storm, thrown into the global spotlight by the heavily publicized referendum earlier this week and Madrid’s forceful response to this unconstitutional measure. Supporters all across the world have been energized by the recent events and have taken to describing them in civil war-era terms as a battle between “democracy” and “fascism”. Furthermore, they also accuse the Rajoy government of being “Francoists”, as they do the country’s post-Franco 1978 Constitution which returned Catalonia’s autonomy in an even more robust way than before and even bestowed this privilege to the rest of the country as well. Although it can be safely presumed that Spain naturally retained some of the “Francoist” members of its permanent military, intelligence, and diplomatic bureaucracies (“deep state”) after the death of their movement’s eponymous leader, it’s an exaggeration to refer to the constitution and the present government as “Francoists” in the sense of what the term stereotypically implies. Rather, the improper use of such polarizing civil war-era terms demonstrates that the separatists are trying to capitalize on the revolutionary nostalgia that their domestic and foreign supporters have for reliving the 1936-1939 anarcho-communist experiment via a simulacrum, one which plays out differently depending on their audience. As it relates to the Catalans themselves, this is meant to force them into the false binary choice between “standing with their ancestors against fascism” or “betraying their motherland for the Francoists”. 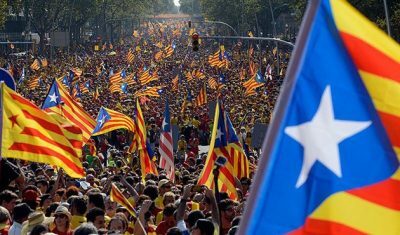 Concerning the foreign supporters of the Catalan separatists, they’re supposed to get riled up and vent their hatred against Madrid and impassioned support for Barcelona all throughout social media, picking up on the cue that they should inaccurately compare modern-day Madrid to post-Maidan Kiev in making the Alt-Media argument that Catalonia has as much of a right to “independence” as Crimea does to its reunification with Russia. This is a false equivocation, the full debunking of which isn’t the focus of this article however, as it’s important enough in this context to draw attention to the polemical chain reaction that’s being spun by the separatists and their supporters in crafting a self-interested narrative for serving their cause. There are many well-intentioned individuals who are standing behind Barcelona, so it’s not at all to infer that most of them don’t sincerely believe in this interpretation of events, but the point here is just to highlight how Catalonia’s “independence” crusade is exploiting historical memory and revolutionary nostalgia in order to advance its organizers’ argument that the region needs to split from Spain. While most people might be led to think that the Catalan Crisis is solely between Barcelona and Madrid, the fact is that it actually involves all of Spain and is poised to have geopolitical reverberations throughout the entirety of Europe. Concerning the politically unstable Iberian country, Catalonia’s separatist campaign already crossed the Rubicon of no return after the referendum and Madrid’s reaction to it, so there’s no going back to the previous status quo. This means that only three scenarios are probable: a centralized crackdown, Identity Federalism, and separatism. The first one could see the state implement Article 155 of the constitution in temporarily imposing direct rule over the region, though with the expected consequence being that it might catalyze a low-scale civil war if the Catalans resort to terrorist-insurgent tactics to resist. The next scenario is Identity Federalism, which would require the revocation or reform of Article 145 in devolving the centralized state into a federation or confederation of regions, each of which could theoretically function as quasi-independent statelets with their own economic, military, and foreign policies. Essentially, this would be the transplantation of the Bosnian model onto Spain, albeit with added privileges given to each constituent member. As with the centralized crackdown scenario, this is likely to lead to violence, and would probably only occur as a “compromise solution” to any prolonged conflict. Madrid does not want to lose control of the country and see the Iberian Peninsula in southwestern Europe “Balkanized” like its namesake counterpart in Southeastern Europe, which is why this outcome probably wouldn’t ever happen in peacetime. Finally, the last possibility for how the Catalan Crisis could play out is that the restive region becomes “independent” from Spain and is recognized by at least one country or more, which in all likelihood might end up being some of the Baltic and/or Balkan states before anyone else. Spain wouldn’t be able to survive in its present administrative-political format with the loss of roughly 20% of its GDP, so the rump state would either have to be radically reformed, undergo a “stabilizing” military coup, or fully collapse in a collection of “countries” just like the former Yugoslavia did a generation ago. As for Catalonia, it could become a base for foreign (NATO/Western/American) intervention into what might then descend into a multisided civil war. A weakened Spain or its remnants also wouldn’t be able to defend from an African-originating “Weapons of Mass Migration” tidal wave into Europe, either. Forecasting is never an exact science, but it is indeed an art, and with that being said, there’s no guarantee that any of the aforementioned scenarios will play out, though if they do, they’ll inevitably have very serious geopolitical ramifications which could end up sparking a chain reaction throughout the region and beyond. The centralized crackdown might lead to a civil war that could either be contained to Catalonia or come to engulf other traditionally sovereign-minded areas such as Basque Country or Galicia too, to say nothing of the rest of the country in general. That said, and accepting that the consequences would inevitably spread to at least Portugal and France as well with time, this sequence of events isn’t what’s the most continentally explosive, as it’s the scenarios of Identity Federalism and “independence” that are the most dangerous. Before going any further, both of these would guarantee that the Catalan Crisis becomes an existential one for Spain. The nominal Kingdom can’t devolve into a federation without changing the constitution, and even if this unlikely event were to happen, then Catalonia might seek to rearrange the country’s internal boundaries in a nationalist bid to gobble up the territory that its most jingoistic supporters claim as constituting the “Catalan countries”. This ultra-extreme concept holds that the modern-day borders of Catalonia don’t represent the historic geo-cultural space of the Catalan people, so they therefore need to be expanded to include all or some of the Spanish regions of Aragon, the Balearic Islands, and Valencia, as well as the country of Andorra and the French department of Pyrénées-Orientales (also known as “Roussillon” or “Northern/French Catalonia”). Most of the people in these areas don’t want to be part of a “Greater Catalonia”, but the hyper-nationalists in charge of the Identity Federalized or “independent” state might resort to subterfuge or force in pressing their claims, even if they don’t do so right away. The concept of the “Catalan countries” is therefore a very dangerous one because it means that the Catalonia issue will inevitably have pronounced internal geopolitical consequences for Spain and also possibly even France as well if the separatists in control of Barcelona right now eventually get their way. Again, the Identity Federalism scenario would likely only result from a war brought about by a centralized crackdown, and would represent a (temporary) “compromise solution” to outright separatism, though with the latent dangers that would come from the latter with time. Whether it’s Identity Federalism or separatism, either of these outcomes could encourage regional copycats all throughout the EU. The UK “Independent” published a very misleading map just the other day claiming to have pinpointed all of the other Catalan-like political movements in Europe, obviously inferring that they could be next if the Barcelonan separatists are successful. The salient point being made here isn’t that each and every one of them will rise up in Color Revolution-esque fervor just like the Catalans did, but that some of them will undoubtedly be inspired to push forth with their agenda in fracturing their home countries and contributing to the “regionalization of Europe”. Other than the Spanish examples mentioned in the map, this could also see a chain reaction occurring in Scotland, Northern Italy, Germany’s Bavaria, and maybe even parts of France too. European regions allegedly seeking independence from the host states. The Hungarian minority that’s been living outside of their nation-state ever since the 1920 Treaty of Trianon might agitate for reunification with their homeland, which could destabilize the politically tenuous situation in Central Europe and the Balkans. It could also make Prime Minister Orban, if he’s still serving by that time, an easy target for liberal-leftist Mainstream Media attacks that he’s the “New Hitler” for wanting to reunify with his compatriots abroad. All that these regional copycats would have to do, regardless of the validity behind their claims and socio-political movements, is to organize highly publicized unconstitutional referenda in order to provoke the state into a forceful response that could in turn “legitimize” a Color Revolution in the said peripheral region. The result doesn’t necessarily have to be separatism, but Identity Federalism, as this end is essentially the same in the structural sense. The devolution of once-unified states into identity-“federalized” ones de-facto internally partitioned along ethno-regional lines would interestingly promote the cause of “Euro-Federalism” that Gearóid Ó Colmáin described in his latest article titled “Catalan ‘independence’: a tool of capital against labour”. His work builds upon the 1992 proposal by billionaire Europhile Freddy Heineken to “federalize” Europe along regional lines, which was likely the unstated inspiration behind Belgian bureaucrat-academic Luk Van Langenhove’s 2008 policy suggestion urging “Power To The Regions, But Not Yet Farewell To The Nation State”. The bigger picture here is quintessentially one of divide and rule, albeit modified for the EU’s post-Brexit conditions. The author himself spoke about this in a different context in his summer 2016 article for The Duran about the “Post-Brexit EU: Between Regional Breakdown and Full-Blown Dictatorship”, in which it was postulated that the bloc might devolve into regionally focused state-driven organizations in the future. What’s happening instead is that Brussels might be preparing for a further devolution beyond the member states themselves and to the individual regions within (and sometimes, even between) them. This represents a modification of what the author wrote in his earlier work titled “Identity Federalism: From “E Pluribus Unum” To “E Unum Pluribus”, which appears at this moment to have incorrectly concluded that the EU wouldn’t go forward with this scenario out of fear that it could invite more “Weapons of Mass Migration” from the Global South (in the Spanish case, from Northern and Western Africa), as well as create geostrategic opportunities for Russia and China. Standing corrected with the wisdom of hindsight and in light of recent events, especially the insight that the author acquired through his research on Civilizational Aggression, it now seems as though the very same scenario of the EU collapsing into a constellation of regional entities is being partially experimented with by none other than Brussels itself as the ultimate divide-and-rule stratagem for controlling the bloc in the post-Brexit era. This doesn’t mean that the process will be taken to its extreme –so long as it’s still “controllable” – but just that the EU does indeed seem to be tinkering with this as part of its phased adaptive approach to the emerging Multipolar World Order. Catalonia is globally significant because of the chain reaction that its separatists have started in furthering the scenario of a “controlled” devolution-collapse of the EU’s existing member-state order into a more “flexible” hybrid one of politically equal national and regional entities. If Catalonia serves as a successful example, whether in the Identity Federalized or separatist instances, then it could have a powerful demonstration effect elsewhere in the EU by encouraging other copycat movements, thereby redirecting what might have otherwise been semi-multipolar forces into the false allure of “independence” within a de-facto strengthened EU and even NATO. This is very possible because the Catalan precedent would clearly indicate that no EU member state’s territorial integrity and constitution are safe from the globalist desires of a separatist Color Revolutionary and possibly even Hybrid War vanguard, thereby dealing a heavy blow to the right-wing “sovereignists” (publicly smeared as “nationalists” in the Mainstream Media) who are coming to the fore of European politics nowadays. After all, the so-called “Catalan Question” was supposed to have been settled by the 1978 Constitution that gave the region an even more robust autonomy than it had ever enjoyed before in history, so if this can be reversed, then Pandora’s Box has truly been reopened all across the EU. Another point to dwell upon is the viralness with which the Catalan separatist cause spread through global Mainstream and Alternative Medias, as this provides crucial insight into how other movements might attain such tremendous soft power in such a short time in the future. It helps if they’re tourist destinations where lots of foreigners have visited and acquired an affinity for the local culture and environs, as well as if there’s a civil war- or other conflict-era history (no matter how distant, decontextualized, and/or irrelevant to the present) that could be spun to “legitimize” the said “federalist”-separatist cause. Altogether, the Catalan case study in all of its dimensions is very instructive in demonstrating how the declining Unipolar World Order is seeking to adapt to multipolarity, and its state of affairs at any given time provides a decent barometer for gauging the dynamics of this process.